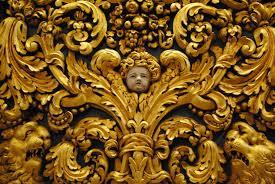 Baroque style originated in Italy and developed in all Europe. It was divided into three periods: Early Baroque (1590–1625), High Baroque (1625–1660), Late Baroque, (1660-. 1725). The term Baroque probably ultimately derived from the Italian word barocco, which philosophers used during the Middle Ages to describe an obstacle in schematic logic. Subsequently the word came to denote any contorted idea or involuted process of thought. Another possible source is the Portuguese word barroco (Spanish barrueco), used to describe an irregular or imperfectly shaped pearl, and this usage still survives in the jeweler’s term baroque pearl. • Idea of a Building– Baroque architects understood it as a single mass to be shaped according to a number of requirements. It was to some extent a kind of large sculpture. • In the facade the elements like columns, pilasters, cornices, or pediments related in various ways to the centre, which thus came to dominate the sides. Although at first sight such a facade might seem to be divided horizontally, more careful consideration reveals that it is organized vertically, in slices, as it were. 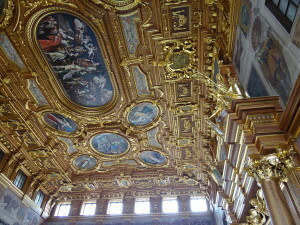 • A Baroque building is complex, surprising, dynamic. Bernini and St Peter’s Basilica- St. Peter’s Basilica, also called New St. Peter’s Basilica, present basilica of St. Peter in Vatican City (an enclave in Rome), begun by Pope Julius II in 1506 and completed in 1615 under Paul V. It is designed as a three-aisled Latin cross with a dome at the crossing, directly above the high altar, which covers the shrine of St. Peter the Apostle. 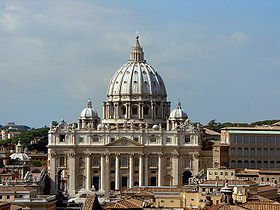 The edifice—the church of the popes—is a major pilgrimage site. Gilded frames-were very frequently used in paintings and mirrors,and usually consisted of several cartouches, carved flowers and sculptural figures. 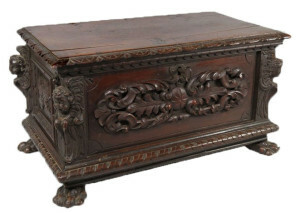 Cassoni- A cassone is an Italian chest; cassoni usually had a raised lid, often decorated with carved leaves and/or figures. 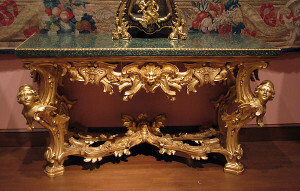 Console tables- were often richly decorated and sumptuous.] 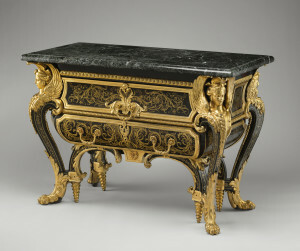 The carved wood was often gilded in gold or bronze, and the table legs were mainly caryatids or muscular figures, made to look as if they were holding the marble slab on top. Cabinets- Segments and strapwork was still used, however, it was also included new features such as pilasters, arched panels and pietra dura designs. Often religious or mythological themes were drawn inside the panels to add decoration to the object. 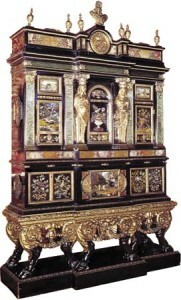 Commodes- were often made of walnut or oak,pearl, jewels and ivory, which made fantastical and allegorical designs. They were often decorated with angels, animals, leaves, saints and flowers. They were called lion commodes specifically due to their lion-shaped feet at the bottom of the drawer. 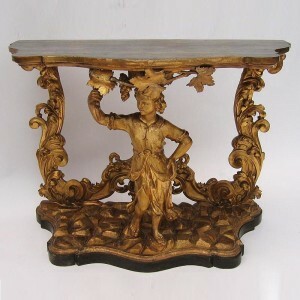 Tables- varied greatly during the Baroque period, but were often made of gilded wood, oak or walnut. 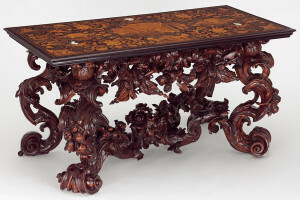 Large tables were long, rich and sumptuous, whilst smaller ones were usually ornate and geometric. 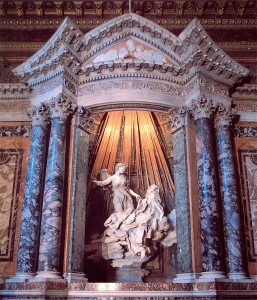 Bernini’s Ecstasy of St. Teresa (Cornaro Chapel)The Cornaro Chapel is the centrepiece of the Baroque Church of Santa Maria della Vittoria in Rome. It is the home of one of Bernini’s most ambitious works The Ecstasy of Saint Teresa, designed and created to resemble a mini-theatre. Theatrically illuminated by a hidden window to the rear of the altar, shafts of divine light descend upon the agitated, swooning Teresa at the very climax of her spiritual ecstasy. Sculpted in white marble, she is surrounded by gilt bronze “rays” which symbolically reflect the divine light. dramatic religious inspiration, movement, illusionism and virtuoso sculpture. 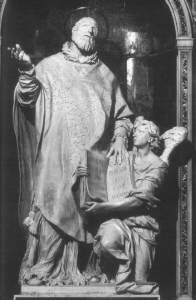 The Ecstasy of Saint Philip Neri with kneeling angels (1638, Santa Maria in Vallicella, Rome) by Alessandro Algardi. The statue is considered his second major commission. Shortly after, he completed a similar group, for the church of the Barnabite Fathers in Bologna – The Decapitation of St Paul (1641-47). This featured the kneeling saint, resigned to his fate, and the executioner ready to strike the fatal blow.